Today we’ll explore a common question I get asked all the time: What is my thought process behind leverage? The short answer is simple. I want to make high returns without being exposed to high risk. Normally the two go hand-in-hand. But leverage allows me to separate them. For example, a speculative marijuana stock may grow 20% to 50% a year. But it could just as easily lose half its value. The potential reward is tempting. But the high risk is not worth it. Instead, I’m looking for a lower return, lower risk investment such as an established pipeline company known for its predictable earnings, dividend growth, large economic moat, and low stock volatility. Using historical data and fundamental analysis I may determine that there is a very high probability this stock will appreciate 4% to 10% a year. I can then apply a leverage multiplier of 5 times on this investment which means my actual expected rate of return is 20% to 50%. That’s pretty much it. The long answer requires some further explanation. Let’s start with the 3 criteria I look for before I borrow to invest. A 10+ year investment time horizon. The first and second rules are straightforward. Billionaire Jeff Bezos recommends we think in 7 year terms to remain competitive. I suggest taking that up to 10 years just to be safe. 🙂 In terms of diversification it can mean more than just having stocks and bonds. Now comes the fun part. Rule number 3. As we all know there is no investment without risk. The third rule is about knowing which investment has a favorable risk to reward ratio. This simply means comparing the odds. For example, let’s say we are asked to roll a normal 6 sided die. If it lands on 1, 2, 3, or 4, we win $10. 🙂 But if it lands on 5 or 6, we lose $10. So should we play? The answer is a resounding yes every time! 😀 We have a 66.7% chance (4/6) of success. So from a rational perspective this has an asymmetric probability in favor of us winning. 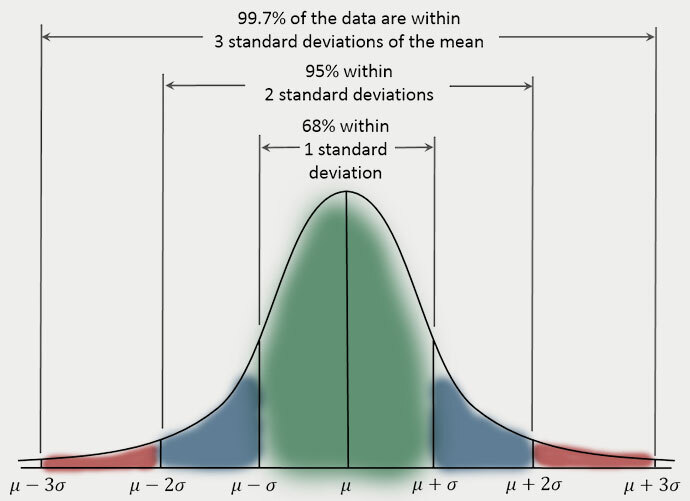 So over the last century, any 10 year period of investing in the S&P500 index would have returned somewhere between 6% to 11%, 40% of the time, or within 1 standard deviation of a normal distribution curve. Additionally, returns were between 3% to 14%, 72% of the time, within 2 standard deviations from the mean. This strongly suggests that we have a 95% chance (95/100 possibilities) of making at least 3% annual return from the stock market in any given 10 year period. Pretty neat eh? 😀 Time in the market reduces risk in the market, and creates a huge asymmetric advantage to investors! But enough theory. Let’s see this at work in a real life example. A couple of years ago I used leverage to buy RBC Royal Bank stocks. Let’s go through my thought process behind this decision. I borrowed $4,000 to buy 55 shares of TSE:RY and contributed $0 of my own money. I wrote a full analysis on RBC and explained why I thought it was a good stock to buy at the time. The reason I used leverage was because I didn’t have any cash and the investment fits my 3 rules of leverage. First rule: I planned to keep RY stock for the next 10 years. Second rule: I made sure RY would only be a small part of my total portfolio. Third rule: RY’s P/E ratio, peg ratio, and other fundamental measurements looked appealing in 2015. The stock was expected to grow 8% to 10% a year for the foreseeable future. Historical data showed strong earnings growth and stock appreciation. RY’s dividend would be enough to cover the interest cost of the debt. Thus, this would have a favorable asymmetric risk-to-reward ratio. My return on this investment so far, net of margin interest cost, is about 37% or $1,500. Not too shabby. 😀 But this shouldn’t be a big surprise. After all, stocks are fundamentally priced based on their earnings. And RBC has an impressive history of consistent earnings growth. Back in 2015, RY was expected to earn $7.35 per share by 2017. Fast forward to today, it appears RY may actually be on track to hit $7.40 EPS this year. We shall see. This leveraging strategy is also recession resistant. For example, let’s say I did the exact same thing in 2007 at the peak of RY’s market capitalization, (the worst possible time to use leverage) right before the greatest recession of our generation. Yikes! Well despite the unfortunate timing, 10 years later I would still end up with a 70% positive return, net of interest expenses! This is why I am not concerned about future recessions. 😉 I know I can just hang on to RY until the stock market recovers like it always does after a major correction. My decision to buy RY is understandable from a rational point of view. If a stock’s price typically follows earnings. And earnings were projected to grow. Then logically it would make sense that the stock price would eventually grow proportionally. And looking back, it certainly did! This outcome was a likely probability from the very beginning. 😉 But without a rational understanding of leverage it may appear that my RY stock returns are simply due to sheer luck. Emotionally, using 100% leverage may sound absurdly risky. But logically speaking it was my best chance at maximizing investment returns. I made a rational decision, and not surprisingly I was rewarded with a highly probable outcome. Other outcomes were certainly possible. The EPS this year could turn out to be $6 or $8. Either number would still fall within my preferred range. However, the farther the actual outcome strays from the expected value (which is $7.35 in this case), the less likely it is to happen. Currently I can borrow on margin at 2%. Therefore, if an investment’s expected return is 2% or higher in at least 1 (but preferably 2) standard deviations from the mean, then I will consider using leverage to buy it. How much total leverage I should use is dictated by a series of stress tests. This means it changes every year depending on stock market values, interest rates, and other economic factors. As of now, I have $63,000 of margin debt. If interest rates ever become too prohibitive, I would pay off my margin loan completely. It would be irrational to use leverage if the cost of borrowing is higher than the expected return from an investment. For my Royal Bank investment, I determined the probability of a favorable outcome was 90%, which is a huge asymmetric opportunity! However, even though I have a 90% probability of winning, I still have a 10% chance of losing. We can’t ignore this fact. If we flip a coin a few times it may land on heads each time (100% heads) or possibly be all tails (0% heads.) But if we flip the coin enough times, the actual ratio of heads will eventually approach the theoretical value of 50%. This is an empirical fact. Of course a 50% chance of success offers no asymmetric investment value. But in situations where the odds are actually in our favor each time, such as the dice game mentioned earlier, then the law of large numbers guarantees that we will succeed, as a whole, if we play enough times! This is why I love using leverage – as long as the outcome is objectively in my favor. I don’t have to be right the 1st time, or even the 2nd time. Mathematically speaking, I just have to invest enough times for the actual ratio of outcomes to converge on the theoretical (or expected) ratio of outcomes. 😉 It’s about the cumulative results. So it’s essential that we learn how to identify asymmetric return opportunities. Leverage doesn’t change our odds of winning. It merely extends our gains or losses based on the inherent odds of the underlying investment decision. I believe someone who uses leverage in a rational manner should in theory outperform someone else who never uses leverage. But I’m just an amateur investor experimenting with different ideas. What do you guys think? Do you use leverage? If not, then at what probability of success, if any, would you consider using it? Leverage can be a wonderful thing and a horrible thing. Although the way you’re using it seems fairly conservative. The company was set to grow and the dividend covered your borrowing costs so it was a great situation for you. If my broker charged only 2% for margin I might be tempted to use it but the current rates are around 6.5% which is a huge hurdle to overcome and really skews the risk/reward profile. Sorry to hear about the high rates. That’s a shame. If my borrowing cost was 6.5% I probably wouldn’t use any leverage either. I think around 5% interest rate is where I’d draw the line for my current situation. Interactive Brokers seems to be the one offering fantastic margin interest rates. I’m thinking about opening an account there at some point. maybe next year. in the mean time, I use rrsp loans at prime (2.7) and a heloc. my borrowing is not generally tied to a particular stock pick though. rather, I fund my portfolio in general. That’s a great rate on your RRSP loan. Mine are usually 0.5% higher. I’ve had great experience with IB so far. I should have signed up with them earlier than I did. The only barrier to entry is they require a minimum of $10,000 USD deposit to open an account. Nassim Nicholas Taleb got famous in the last 15 years in financial circles for showing how disaster ensued from finance risk management models that assumed a bell curve distribution. Read “The Black Swan”, “Fooled by randomness”, and “Anti-fragile” for details. If your modelling of risk is based on the normal Gaussian distribution, you are in for quite a few surprises down the road. I wish you well! Thanks for the recommendations. I will check out those books. I hope the author covers solutions or alternatives to the bell curve distribution. I’m always open to better methods of managing risk. Thanks for the input as usual John. 🙂 I read MDJ too. I’m glad he reached his goal of a million dollar net worth by his mid 30s. I’m aiming for the same. I use exactly same leverage strategy you mentioned. I borrow money from different sources (average less than 3% interest rate) and buy blue-chip dividend growth stocks with 3% or more dividend yields. It works really well for me so far. Right now, I have a over $200K diversified portfolio 🙂 . It is bit of risky approach, but if you use it right, it will workout well 😀 . I’m a big proponent of using leverage as long as it’s in a sustainable and responsible way. Probably my biggest lost financial opportunity was not using leverage in my 20s. I just wrote a post about how I use leverage if you’re interested. Interesting article enjoyed reading it. i currently am fully invested within my tfsa a/c and rsp a/c and do not have extra money to start a margin a/c to pour additional money into market. I am a typical buy and hold dividend investor and all my investments doing well. I would very much like to borrow money to invest to increase my return . so what are my options of borrowing and which will be the best one can u please share. i will very much appreciate it. It sounds like you are doing things correctly. I also max out my RRSP and TFSA first. If I have additional savings after maxing out my tax advantaged accounts, then I would invest in my margin account. One thing you can consider is to use an RRSP loan from any bank to fill up your RRSP contribution room. Use the next 1 or 2 years to pay it back. In the meantime, invest your savings into a margin account so you can build up a portfolio that you can borrow against in the future. Interactive Brokers probably has the lowest margin interest rates. Liquid do you know if it’s possible to take money out of a margin account, which would be a sort of ‘margin loan’? Example: say the margin trading account has $100,000+ in equities fully paid up currently no margin owed on the account. The equities in the account are’Blue Chip’ stable dividend paying. The account holder wants to take $30,000 out in cash – if that is possible & the margin interest rate (IB) is 2%, then with the $100,000 of equities earning say 5% dividends, the account can pay itself from those dividends. The $30,000 taken out of the account moved to a bank account could be used for further investing or to pay off higher interest LOC, HELOC, other loans. Would that be a case for ‘good leverage’? Yes you can do that. 🙂 Just transfer $30,000 from the margin account into a bank of your choice. Doing so would mean you have -$30,000 cash and +$100,000 gross stocks, which gives you $70,000 equity in the margin account. I think having a margin account is a good idea even if we don’t use any leverage. It gives us the option to borrow money against our stocks in the future, should we need to. Tax planning can be tricky. The potential for OAS claw back is a reason why some working age Canadians have prioritized TFSA over RRSP. On any ‘stock market’ investment there are no guarantees that holding a particular position it will sustain or remain at the average price the person paid for it. Doesn’t matter if it’s Canadian – Bank, Telecom, utility or transportation stock, or that folks keep on DRIP’ing, buying more to cost average. Or that folks have 25+ stock positions. Going with that, just make sure you hedge and/or make sure that the capital never depletes & always have an exit strategy. I’ve live through a couple of those financial crisis & being ultra conservative have never over extended myself. Maybe old school, but hey it worked for us. Knowing what I know now, ‘could we have made tons more money’ – well of course, then again I don’t like complicated things in life, as well as I like to get a good nights sleep. John, really appreciate your posts! Would love to know more about how you melted down your RRSP. I know there are various strategies out there but would like to know the method you went with and why. Thank you so much for the detailed reply, John! Ahh yes, the spousal RRSP, as a single guy I forgot about that, that’s a powerful weapon in the arsenal to melt down the RRSP. My RRSP is a pretty decent size (a little over $170K) so I’d have to take out a pretty huge loan to get enough interest expense to melt it down, and it will take a long time. My RRSP is all dividend stocks and has a yield of about 7% (due to dividend increases from the companies over the years). Had a shower-thought awhile back and realized at some point I’ll need to quit working for tax reasons so I can melt this thing down. But for now I’m still contributing and maxing out my RRSP. Congratulations on a life well-lived and a retirement well-done! How are you able to get a margin loan for 2% interest? What broker/bank do you trade with? I find that more amazing than the content of this article as I’ve wanted to use smart leverage for quite sometime. Unfortunately I’ve only been able to do it with rental properties but my preference would be with equities, a lot less of my time to manage. Here is their interest table. For Canadian dollars it is currently 2%. This number changes depending on central bank policy. Where did you get a 2% margin rate from? That’s wildly low and I can’t seem to find anything like that online. @ Brett, let me jump in on this one. Sorry for the double post, didn’t know it put it on the bottom. Do you have an excel spreadsheet to calculate the loan interest / dividend payout to see how much leverage makes sense? I sort of made one but it’s not working the way I want. I’d rather modify one that works. That sounds like a pretty solid strategy. It could work really well. 🙂 I’ll see if I can find some stocks that match the criteria. They would have to be ones with less volatility than the general market I assume. Hi John! I really appreciate your insight and depth on the retirement issue. I wanted to ask for your advice but not sure if you are still reading this thread. Please advise if you do or if I could email you. Thank you in advance for your time! Does someone have an excel sheet that I can run the mechanics on to see if the loan is worth the dividend paying stock. I’d like to input the following: Loan Term, Loan Interest, Loan Amount, payment periods, compounding periods. Then I input: My cash amount (invested in the same thing), dividend amount, dividend payment periods. And it tells me what my cost of borrowing is, how quickly it will be paid off, and what my net is. If we want to get fancy i can input my tax bracket. I can’t get my spreadsheet to work correctly.